An ancient fishermen village containing famous synagogues and churches along with a beautiful lobby, boardwalk, intricate lagoons, bays, springs and hidden waterfall. Kfar Nahum national park (also Capernaum) is located on the western side of the Kineret. It stretches along the coast from Amnon gulf to Tel Knarot . Who Nahum, after whom the village is named after, is unknown. Known also by its Arab name: A'Tabha, which is probably a mispronunciation of the roman name Patpagon meaning: seven springs. At 159 BC a Christian pilgrim states in his logs the areas name: Taboga Israel's nature and park authority has developed inside the national park an aiding area to visiting the antics churches and springs, a ship yard aiding the visitors to reach Kfar Nahum by boat from Tiberius and Ein gev. Due to the changing water level, a floating boat yard was built which adjusts itself to the changes in water level. The area is the naval gate for many sites at Kfar Nahum. A main comfortable road was built with basalt stone which integrates in the structures and scenery located on the nation park's beach stretch. On site: information station, gift shop, park offices and restrooms. The park embodies in it unique components from the nature field, archaeology, Jewish legacy and Christian legacy who's roots are planted in this stretch of land. The stretch of shore here is one of the only ones in Lake Kineret which preserved its wild life and vegetation in their natural order. The Kinerets edges are characterized by a Savanna like vegetation, with Ziziphus Spina. The Ziziphus trees are accompanied by grassy vegetation rich in species. Near the water's edge, the typical Phragmites bush are found. Alongside the national park a wide array of bird species are found. This area is rich with springs, mostly sulfur waters. And its land- Thesaurus ground. Up until the 19th century this area was mostly neglected aside for some Bedouin families from Al Samhia tribe. The area has many springs gushing at different temperatures and salinity. We'll extend on two of those: Job spring and Job fall Adjacent to the northern side of Behorat Petrus church, between the road to the Kineret, hidden from the eyes of drivers lays a small patch on gods land: Job spring and Job fall. The spring which up until the war for independence was also named Job bath or El Eyob Hamam, is located down several steps ending in a built lobby. Salinity: 1000 Milligrams of Chlorine per liter, heat: 27 Celsius. Over the spring- the remains of an ancient pool from the Roman/Byzantine era. Its inner height is 6.5 meter, its diameter is 2.5 meters and it's a meter and a half high. Now days the spring waters flow through a crack in the bottom of the pool, which explains it low water level. In the past the water filled the pool up to its edges and was used to water farm lands built on slops using gravity. The area is connected by different traditions to biblical Job. Traditions say that Job visited this spring to try to rid himself of the boils given to him by the devil. The spring's water are said to have healing powers, and many come to bath in its waters. A small cave is visible on the mountain side over the spring and is also connected to the spring, as it is said that this is where Job lived while he bathed in the pools water. A small staircase heading from the yard towards the Kineret leads to Job waterfall- a magical waterfall gushing from the dense raspberry vegetation, as it flows to the Kineret, creating an array of small pools and fresh brooks. The shades of blue, green and black of the coasts Basalt stone creates a rare compilation of colors and scents. Job waterfall was created due to a drilling calledKineret 7. During times when the Kinerets water level is high the pond and the waterfall connect, and reaching it could only be done by swimming to it. 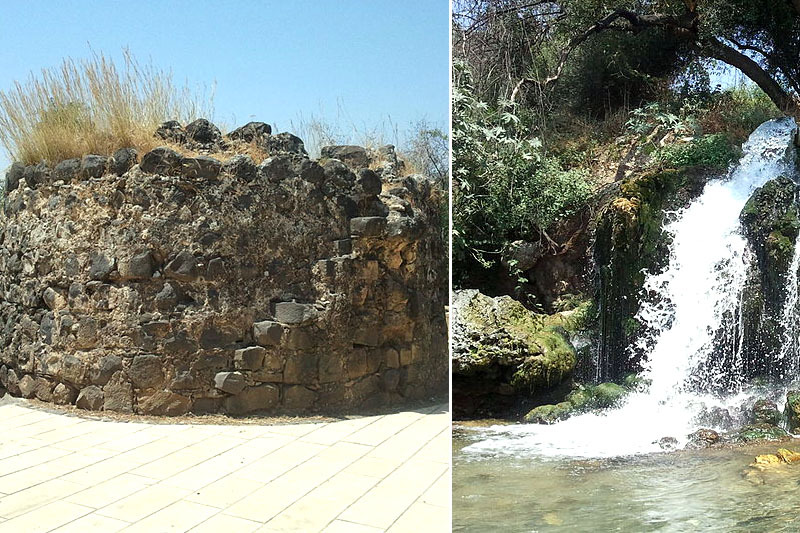 This is the bigger and more important of the springs, and is also called Ein Ayovat El Tabha and Ein Ali A Ta'har. Formed by two springs containing different water properties. Its salinity is high and not drinkable. Its salinity is 2300 milligrams per liter and its temperature is 27 c. Over the spring, an octagon pool which was probably founded in the Roman times. Each side is 8 meter long and its diameter is 20 meters. In the 18th century the pool was fixed by a Bedouin governor in the Galilee named Ali A Tahar, where it go its name. Up to the 30's the pool was deserted and its waters gushed to the sea. When the pool was purchased by the the Italian mission, it was cleaned and covered by a cement ceiling. Now days the water flows to the salty water conveyor. Out of Nur spring an ancient aqueduct crossing through Ginosar valley on columns which remains were gone by the 19th century, used to water the fields. The aqueduct also provided hot water to the roman bath house which was located next to Ein Kinar spring- a fountain deriving from the steep cliff of Tel Nikrot. Where the warm spring waters gush into the Kineret enter, in winter days, the Kineret's fish and specifically the cold sensitive cat-fish. The ancients believed that faraway lands and water sources are connected by underground tunnels since the cat fish who resides in the Kineret also resides in the river Nile. It was believed that the Kineret and the Nile were connected by an underground connection through the spring. The first Israeli hydro turbine From the end the 20s to the 50s the spring water ran the turbine and created electricity. The turbine was maintained by Abraham Nahmani, a Jew who grew in Tabha monastery. During the liberation war Nahmani used to provide water to the Golan regiment. During the day the power was used to operate the water pump and at night the station provided power the area and to the Italian establishments at Ein sheva. 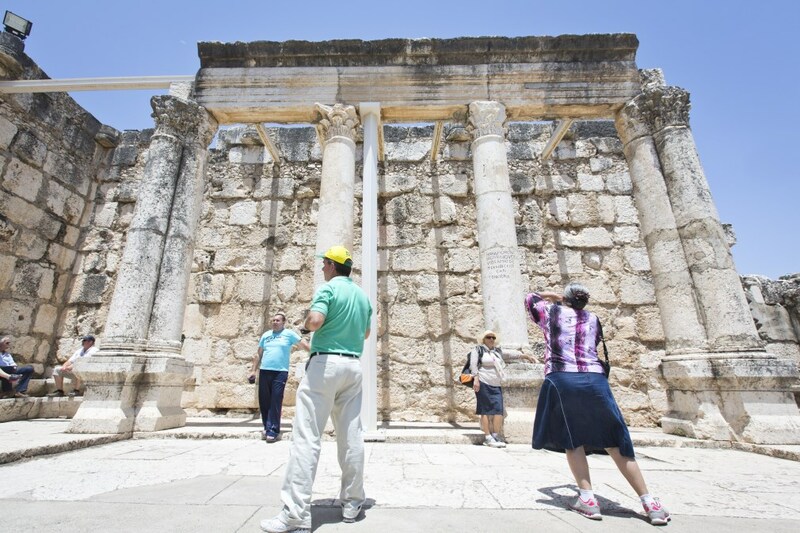 the cradle of christianity The ancient town of Kfar Nahum is known because of its importance to Christianity. It was the place Jesus lived in the New Testament and was even referred to as his town. The north-western side of the kineret was the center of Jesus activities in the Galilee: adjacent to Kfar Nahum Jesus found the first apostil, he taught in the Kfar Nahum synagogue, astounded with his sermons and caused many miracles in the town and its area: walked on water, fed many with just two loafs of bread and five fish, calmed storms at sea, exorcised demons, healed the sick and much more. During the byzantine era, when Christianity became the ruling religion in the Roman Empire the sites were sanctified and churches were built over them. These churches were presumably destroyed during the Persian invasion of the land. As time passed those wrecks were covered and their exact location was lost. During the end of the 19th century and the beginning of the 20th century those places were found and some of those lands were bought by Christian foundations around and new churches were built in their place. The Tabha region-Mount Osher-Kfar nahum is called the sacred triangle- an imaginary triangle which the three churches create immortalizes what Jesus did. 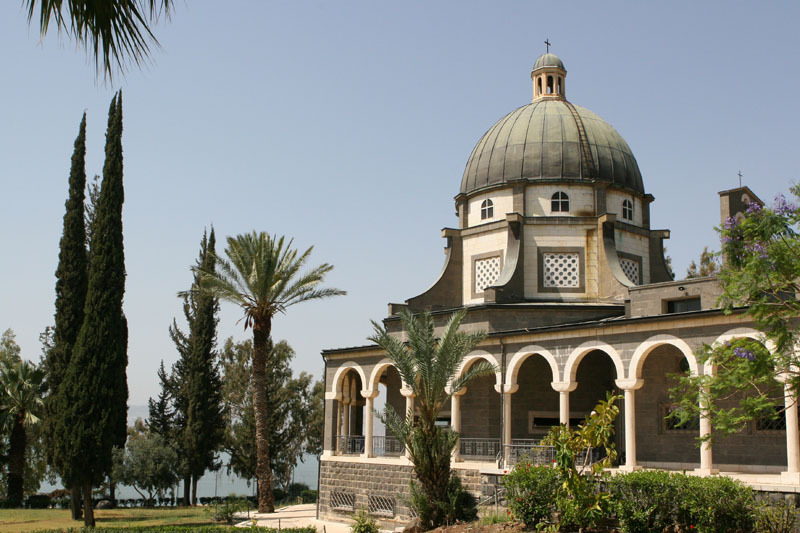 A beautiful church located at the top of a 125 meter mountain, overlooking the magnificent view of the Kineret the Golan Mountains and the Galilee mountains. Christian tradition attributes this place as the place where Jesus gave his followers the "sermon on the mount". On mount Osher Jesus picked his 12 apostles who spread his dogma. One of the holiest sites to pilgrims. 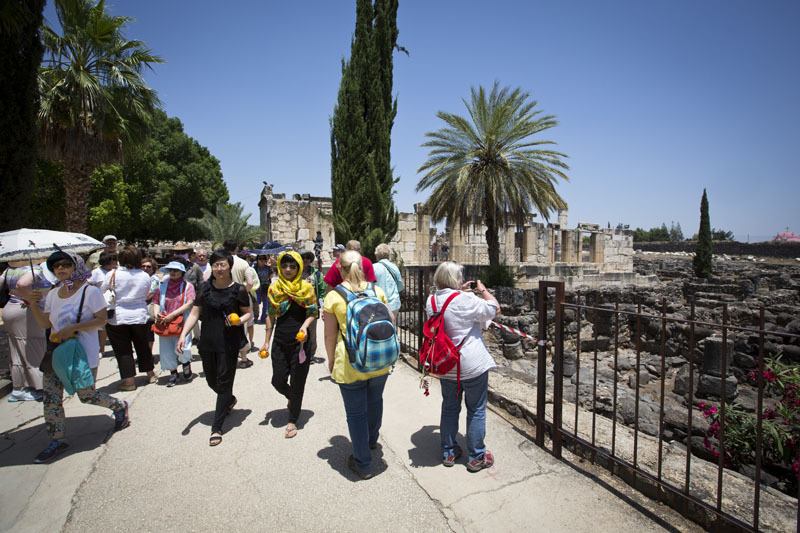 Christian tradition states that this is where Jesus stayed with his students and accompanies. His students told him that his followers count 5000 and are hungry and have nothing to eat. Jesus sat them down and fed them all with merely 5 loafs of bread and 2 fish. Even after everyone finished eating, 12 baskets of fish and bread still remained. 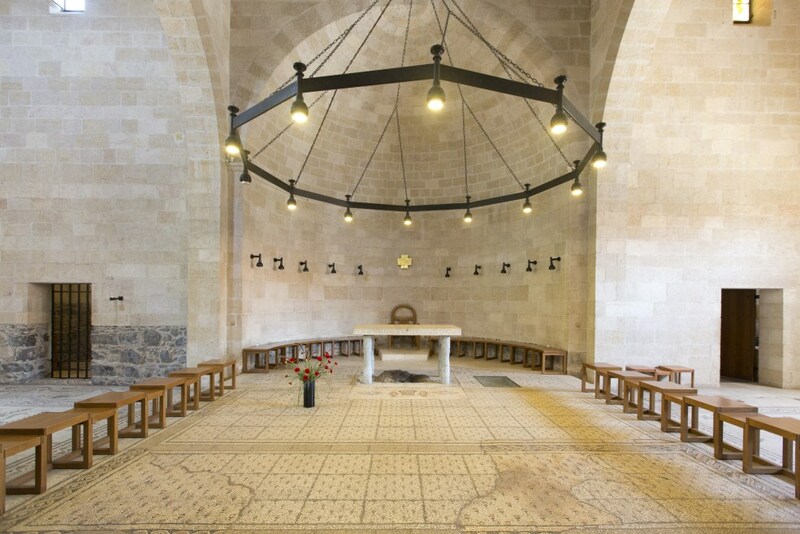 The church has an ancient mosaic floor that immortalizes the miracle of the break and fish abundance with picturesque descriptions of the wild life and vegetation of the Kineret. Adjacent to the church is the Church of primacy of St. Peter which by tradition is where Jesus reviled himself to his students after his crucifixion. Jesus crowns St. Peter to be his first apostle. With this St. peter as the highest authority with Jesus students and is actually the first pop in the Christian church. The church is built around a natural stone which can be seen inside the church. Among the remains of the ancient fishermen village, lays one of the biggest and nicest synagogues discovered in Israel. The synagogue is built of chalk stone, and is engraved with many pictures of the wild life and vegetation, geometrical shapes and classic Jewish decorations as the menorah and shofar. Near the synagogue lays a site with great importance to the Christian visitor- the house of St Peter where Jesus stayed at Kfar Nahum. Now days a modern church was built over the home, which is still used as a place of prayer by thousands of pilgrims. The church is modern in its design, made of a concrete octagon with a see through floor posted over the ancient remains. The village stretched over 300 meters on the Kineret's shore. A Jewish settlement started existing during the 2nd century. The residents of Kfar Nahum made a living in fishing, agriculture and commerce. The village was on a path to the river Jordan. The ancient site is maintained by the Franciscan church and entrance with it is with charge. Mausoleum- 200 meters north of the synagogue on 1977 a mausoleum from the 1st century was discovered. It was probably owned by one of the rich families of Kfar Nahum. The main structure was made of Hewn stone which a small part of remains. The underground structure was built with basalt stone and is almost entirely preserved. The Greek orthodox church- church of the 12 apostles: The Greek church of the apostles is located within ancient Kfar Nahum. Next to the lobby of the national park. The church was constructed in the 20's of the 20th century in the days of the Greek patriarch Damianos. It is covered by pink domes, and is built in church style resembling churches in the Balkan. Next to the church a mansion was built to be used by the patriarch during winter days. This church is dedicated to the 10 apostles who were chosen by Jesus next to Kfar Nahum. The ground on which it is built was bought in the early 20's. after the war for independence the border line shifted and the church which was now on forsaken territory was abandoned and was used as a barn. On 1969 restorations began and the church, along with its mansion was renovated and around it orchids and plantations were groomed. In the church, frescos illustrate different activates related to Jesus and his apostles. Access : The national park is located next to route 84 on the northern shore of the Kineret. For those who come from Tiberius- Rosh Pina route, turn on Kfar Nahum junction towards Tabha. The entrance to the gardens lobby is about 3 kilometers north of Tabha junction. For those arriving from Ein Gev: in Yehudiya junction turn towards Arik bridge. The entrance to the garden is about 3 kilometers passed the bridge.